San Diego Entrepreneur needed help in executing a new concept in restaurant and bar directories. Acorn Interactive provided consulting services to help Dining Joint expand its initial set of ideas into a rounded suite of services that would have strong appeal to the public and encourage advertizing sales to the owners of restaurants, bars and eateries across San Diego County. Dining Joint members and non-members can browse the largest, most accurate database of San Diego restaurants and bars available, send invitations, read fortune cookies, view street camera views and maps, check distances, find joint features such as live music, dancing or internet access and up-to-date information on happy hours. 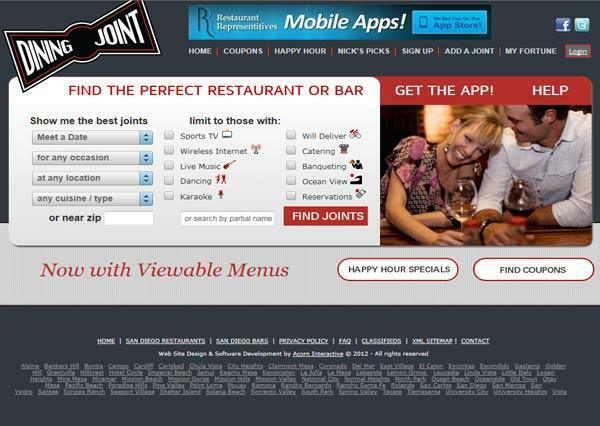 This highly interactive site emcompasses extensive geo-mapping, advanced database search capabilities, extensive backend membership capabilities that enables joint owners to post menus, classified advertisements, dynamically created coupons, specials, photos, joint profiles and more..